There aren't many streaming devices that we still haven't reviewed here at Cordcutting.com – and we're knocking down a big one today. Amazon's Fire TV Stick is one of the most popular entry-level streaming devices on the market, so we decided to see for ourselves just how it measured up to its big brother (Fire TV) and primary competitors (like the Roku Streaming Stick). Here's our complete Amazon Fire TV Stick review. The Fire TV Stick itself looks about how you'd expect it to: it's a HDMI stick, about three and a half inches long. This second generation model looks identical to the original, but it's a bit more powerful under the hood – the dual-core processor has been swapped out for a quad-core one. Memory (1GB) and storage (8GB) remain unchanged, as do the Wi-Fi specs. The Fire TV Stick is still weaker than the full-sized Fire TV, of course, and it's Wi-Fi-only. The Fire TV Stick tops out at 1080p streaming, so 4K fans are out of luck. The device has a power adapter, and has to stay plugged in. Everything in the box (clockwise from top right): Alexa Voice Remote with batteries included, two-piece USB-to-micro-USB power adapter, HDMI extender, and the Fire TV Stick itself. The biggest difference between the old model and the second generation is that the latest version of the Fire TV Stick comes with the voice remote – the same one you'd get with the full-sized Fire TV. Yes, Alexa is on the Fire TV Stick, and that makes a big difference in the user experience. The Fire TV Stick comes with the same Fire OS that the Fire TV does, so it enjoys the same benefits (and the same drawbacks). Amazon's app library is large and growing, and while Roku still has a slight edge in streaming apps, Amazon has all the big players and also boasts a very solid selection of simple games and non-streaming apps. It's a simple and feature-rich OS, and while it's not quite as simple as Roku's, it's a very strong offering. We covered the Fire TV OS in a bit more detail in our Fire TV review. What really makes the Fire TV Stick fun is Alexa, the virtual assistant who just continues to grow more powerful and useful. Alexa can help you find content just like the Roku voice search can, but she can also answer questions (¢who is in this movie?¢), launch apps, help you buy things on Amazon, and even order pizza through the supported Domino's app. I did not voice-order any Domino's during this review, but it was empowering to know that I could. Once you're comfortable with Alexa, she becomes a total game-changer. 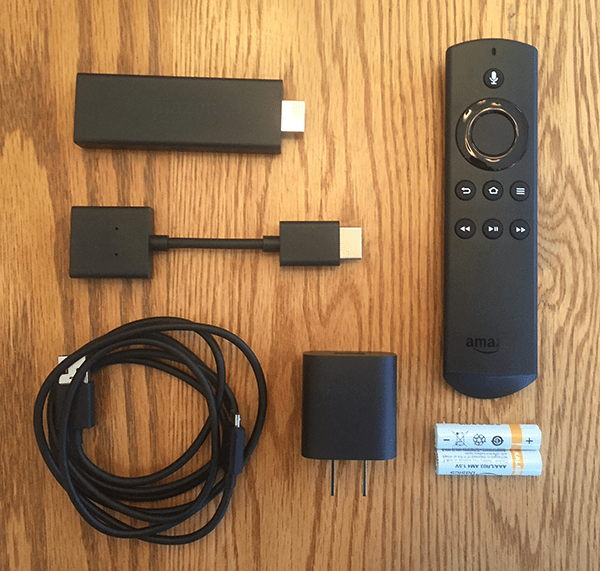 Alexa is far and away the biggest advantage that the Fire TV Stick has over the Roku Streaming Stick. Of course, Alexa has an agenda. She would love for you to buy things from Amazon, and the Amazon tilt of the Fire TV OS in general is still a major difference between the Fire TV and competitor products. The entire Fire TV experience is far less brand-agnostic than most competitors. You'll find that Amazon products are surfaced in various ways, with separate tabs for Amazon Music and other tie-ins with Amazon Prime. Amazon's app library is pretty much the peer of Roku's channel store at this point. You'll see more in the way of true ¢apps¢ that have nothing to do with streaming – like the Domino's app that Alexa can use – and in terms of lightweight games, which Fire TV has a solid selection of. Amazon has almost all notable streaming apps, but a few (like NHL.TV) are still missing. As mentioned in the User Experience section, the Fire TV Stick likes to surface Amazon content. If you have a robust Amazon library, the Fire TV Stick will be especially appealing. It's more of a user experience difference than content difference, though, since Roku and other competitors can still play your Amazon library. The Fire TV Stick is Wi-Fi-only, so you can't connect via Ethernet cable like you can with a full-sized Fire TV. The Fire TV Stick streams very well over Wi-Fi, however. Streaming is smooth and reliable on a variety of apps. The most I noticed was that HD was slow to kick in at times – interestingly enough, I ran into this problem when streaming my own Amazon library. Still, everything snapped back into HD within 10 or 20 seconds, and once things were buffered up I ran into no problems at all. Once in the swing of things, the Fire TV streamed as well as products that cost twice the price. , putting it right in line with its main competition, the Roku Streaming Stick. The $35 Chromecast is less of a direct competitor, but still factors into the streaming stick picture for shoppers at this price point. The Fire TV Stick is, of course, a great deal cheaper than its full-sized brother and its competitors, which retail for about $100-$150. I was very impressed with the Fire TV Stick. Alexa is remarkably powerful and easy to use, and she makes the Fire TV Stick user experience simple and even fun, assuming you don't get self-conscious about speaking to a remote control. The Fire TV Stick, like the full-sized Fire TV, will hold special appeal to loyal Amazon users – while non-fans will find their interface cluttered with vestigial features aimed at Prime subscribers. The Fire TV Stick runs neck-and-neck with the similarly superb Roku Streaming Stick for dominance in the streaming stick space.